The Island of Grand Bahama. The dark blue color on the south side of the island indicates deep water. The red line is the Grand Lucayan Waterway built in the 70’s that connects the north and south side of the island. Major man-made changes to the geography of Grand Bahama in the 1960s – 1970s altered the connection between the shallow Little Bahama Bank on the North side and the deep New Providence Channel on the South side of the island. In particular, the construction of the Grand Lucayan Waterway created a new connection, while construction of a shipping harbor obstructed a natural waterway, Hawksbill Creek. These land-use changes potentially altered the spawning migration patterns of fish around Grand Bahama. 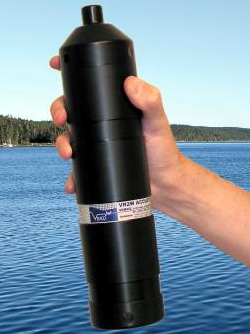 VR2 receiver that was placed in the waters around Grand Bahama to record bonefish locations. Bonefish, sometimes referred to as the gray ghost by anglers because of their elusive nature, are extremely important sport fish in the Bahamas. 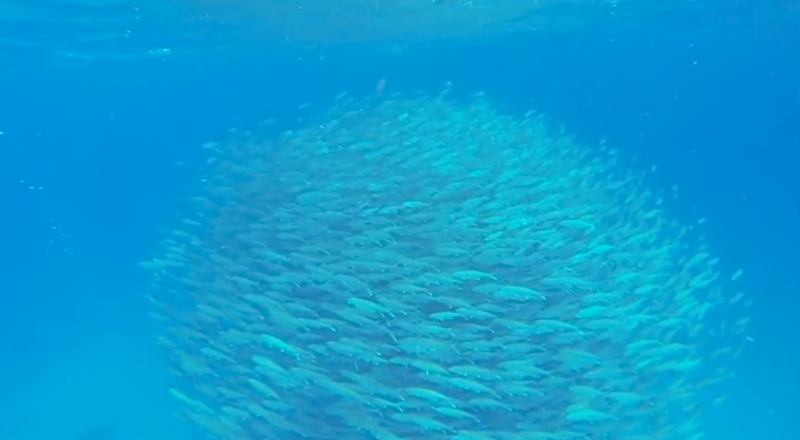 Recent research on Eleuthera, Abaco, and Andros has shown that these fish migrate from shallow flats to form pre-spawning aggregations near deep water. The goal of this project was to assess present-day movement corridors of bonefish around Grand Bahama during the spawning season (October to May). 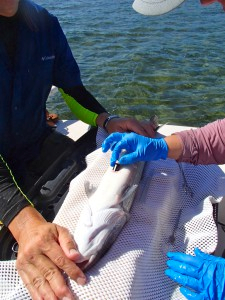 Bonefish tag implanted in October 2013. To accomplish this task, CEI in collaboration with Fisheries Conservation Foundation, College of the Bahamas (Freeport), University of Illinois, Illinois Natural History Survey, Carleton University, and H2O Bonefishing surgically implanted 30 acoustic tags into bonefish and deployed 17 acoustic receivers around the island in October 2013. The receivers were downloaded in June of 2014 and revealed that 7 of the 24 fish tagged on the North side used the Grand Lucayan Waterway as a corridor from the north side to the south side of the island. 2 fish were recorded swimming around the west end and 2 others around the east end of the island, which are each over 80 km journeys. This indicates that bonefish are most likely forming pre-spawning aggregations on the South side of Grand Bahama and will guide research efforts during the next spawning season. 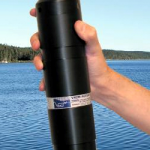 The outcomes of this project will be shared with decision makers so they can make informed decisions about protecting migration corridors from spawning grounds to aggregation sites. Bonefish spawning aggregation. Photo by A. Danylchuk.